TULARE – Rice growers in central California are among those discovering the quicker, easier way the 24 foot-long GPS controlled GK Switchblade Scraper flattens out their land. The machine, which weighs 14,000 pounds, is hauled by a tractor and is easy to operate. The coordinates of the field are entered into the system, the blade is set to the desired level, and the tractor drags the machine around the field. It can travel at speeds of up to 12 miles per hour. Unlike other scrapers in the agricultural industry, the blade can fold and unfold to as small as eight feet in width for travel purposes by simply pressing a button located in the tractor cab. “At this point in time it’s saving money, it’s safer, and it’s a very good cutting machine, so guys can move a lot of dirt in a short time,” Wolf said. GK Machine Inc. has been manufacturing the units for a year. There is heavy interest in several of them, and four more will be built in the company’s plant in the next four weeks. More will be built throughout the summer to keep up with the demand. The GK Switchblade Scraper is one of the top 10 new products featured at the World Ag Expo this year, and the blade is already getting lots of attention. 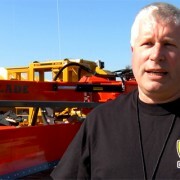 GK Machine Inc. is located on the World Ag Expo grounds at booth spaces 045 and 047. For more information, visit www.gkmachine.com.